When I first got to Colombia, the first thing I looked for was (no, not cocaine) coffee. I never tried cocaine, even that they’ve been easily available for me since arriving Latin America. I love coffee. In Capurganá, my port of entry in Colombia, I saw many locals peddling coffee in old fashioned thermos and small disposable plastic cups. In sari-sari store type, coffee are in large stainless steel coffee dispenser. I was really excited to try them. 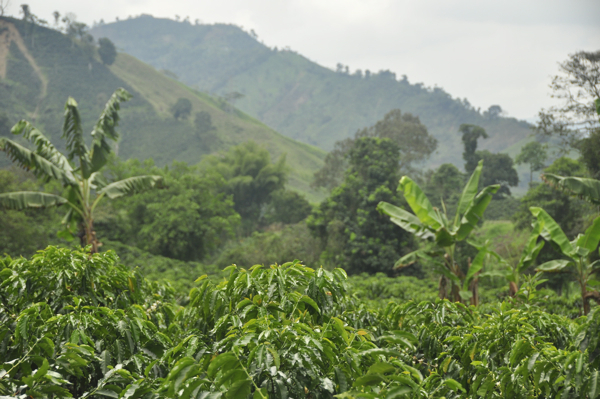 Colombia is the 2nd largest coffee producer in the world. Brazil being the largest, and surprisingly for me to learn, Vietnam is the 3rd. Colombian coffee, from its reputation and my experience, are really one of the best in the world. So I was so disappointed that they tasted like coffee candy dissolved in hot water. It’s a longer way of saying it’s crap. In Capurgana, we actually went to a bar/cafe with Illy sign. Of course, it didn’t make me think that Colombia doesn’t produce outstanding coffee, just that maybe they’re not available locally, that maybe all good ones are exported. Why not? Until I was about 16 years, I thought all bananas have black spots. For as it turned out, all the perfectly shiny yellow ones in the Philippines were exported. I’ve learned in another coffee tour that years ago, Costa Rica exported 100% of the good coffee and so the locals only drank bad coffee. But happily now they retain 50% for local consumption. as the name suggests, is the center of coffee production in Colombia. Its elevation between 800m to 1800m is the ideal altitude for coffee growing with the right amount of sunshine and rain. 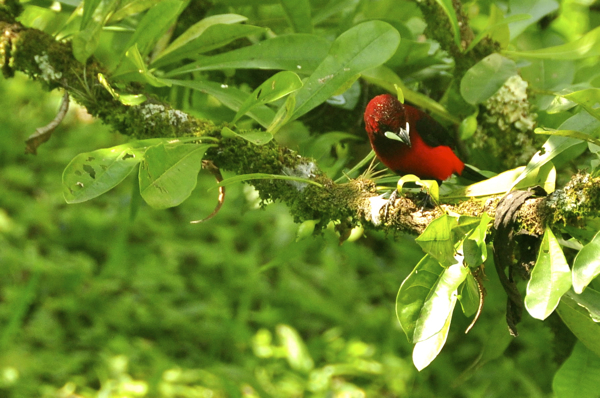 The area has beautiful rolling countryside of coffee plantation interspersed with banana, platano, and bamboo trees. The best way to enjoy this area is to stay in a coffee farm where you can tour the plantation and learn about how coffee is produced, harvested, and everything in between. 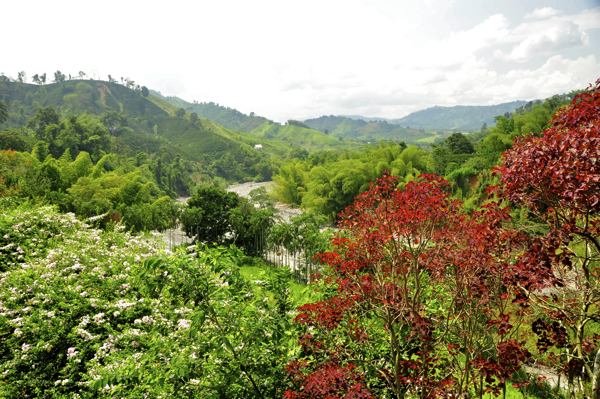 I had the pleasure of coffee experience at Hacienda Venecia located just off city of Manizales. It is here where I had one of the most relaxing stay, got to learn everything about Colombian coffee and needless to say, drink as much of their best coffee as I can. If I wasn’t on a bit of a rush, I would have stayed a couple of days longer. 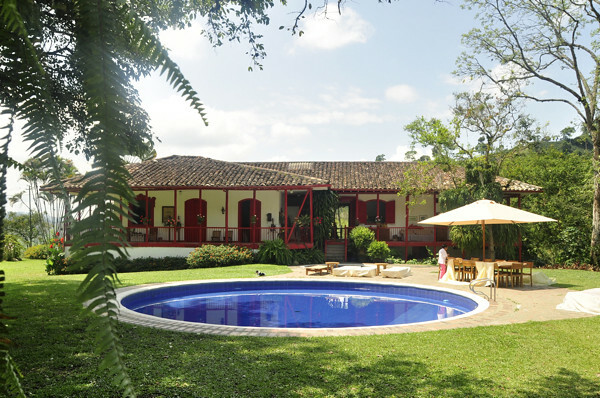 What’s nice about Hacienda Venecia is that they made the luxurious stay in a coffee plantation available to backpackers. With the size of their hacienda, it doesn’t take a genius to realize that it is not with the 7 bedroom/15-beds guesthouse that they make their money. Yet the way they maintain the household, you feel very respected and welcomed as a guest. Each room sleeps 2 or 3 people and they’re impeccably clean, as if it’s run by my mother. Really, move the bed and you don’t see dusts or cobwebs like the hostel norm. Fancier accommodation is also available in the hacienda. 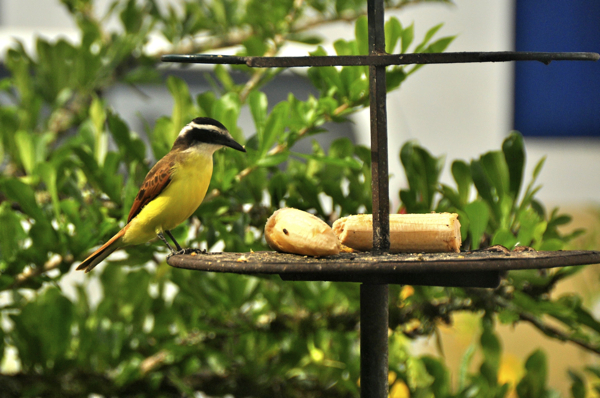 As the house sits in the middle of the hacienda, you see nothing but green 360 degrees and the more than occasional colorful birds. They also have a swimming pool. It is significantly lower in elevation than Manizales, although just 30 minutes away, so the temperature is a lot warmer. I don’t need a pullover at night kind of warm. All these for $15 a night with breakfast and unlimited coffee. It’s not easy to get out of the hacienda but then you wouldn’t want to. Lunch and dinner is available at $5 each. Food is unremarkable but the coffee is outstanding. The 4 hour coffee tour starts 9am. It costs $15 with 50% discount for in-house guests staying for minimum of 2 nights. The tour is not as professionally conducted as the one of Britt in Costa Rica but the experience is more authentic with the walk through the actual plantation. It would have been a lot more interesting to come during harvest period of October to December or May to June. Colombia is unique in having harvest twice a year. The million dollar question: crappy coffee? But first we learn where coffee originated. In Ethiopia between 8-15th century. I put it down so that I never forget it again. I learned this in Costa Rica but have to be reminded in the coffee tour Colombia. Incidentally very recently I was tested, by a Colombian dude in Brazil who thought I was insulting his country by saying their coffee is crap. He of course jumped right in the beginning of my storytelling. I was not even telling it to him. He asked if I know about coffee and if I knew where coffee originated. How sweet that the coffee tour was still fresh in my mind. And he received a doze of lashing courtesy of my sweet – sharp tongue. Then we learned about the process and how many stages (a lot!) 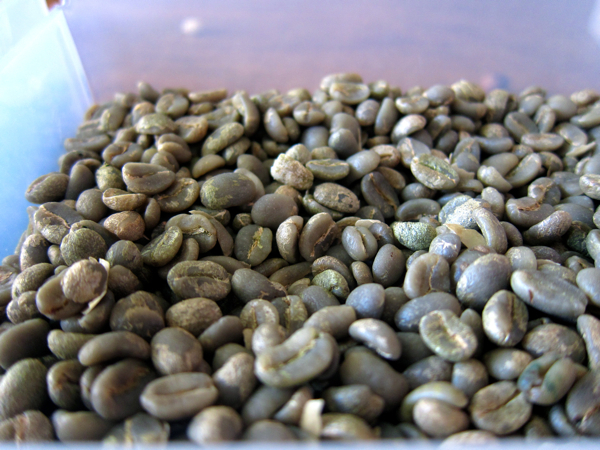 of selection these beans have to go through to finally be good enough to be stamped with “Café de Colombia”. 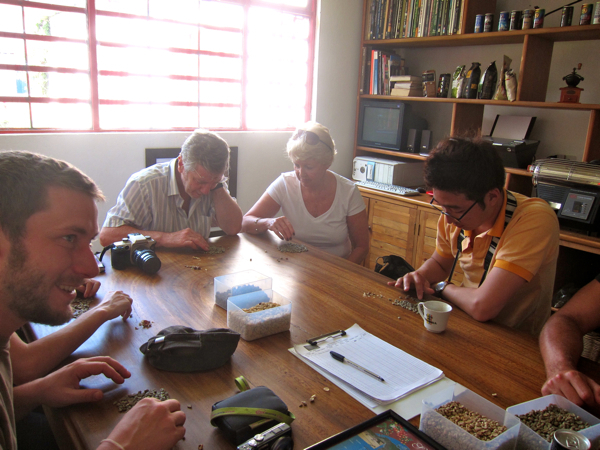 We even get to simulate the beans selection, which we later roasted, brewed, and drank. The tour ended with a small hike around the plantation and the plant for processing. By law, only coffee beans that have passed through all the quality check are allowed to be exported. So whenever you’re outside of Colombia and drinking Colombian Coffee, you’re guaranteed. So guess what happens to those that didn’t make the cut? They are gathered together, roasted for a long, long time to make it dark and fragrant, but really to hide its imperfection. Then they brew them with a lot of water and sugar to hide the bitterness. And this is what you get in the street, popularly known as “tinto”. But it is after all possible to get great coffee in Colombia. Just look for the mark “Cafe de Colombia” in the supermarket or go to Juan Valdez. Juan Valdez is a fictional character coined by the coffee growers federation in Colombia to represent a typical Colombian coffee farmer. It is also a symbol of the high quality of Colombian coffee . Juan Valdez coffees and coffee shop chain are found all over Colombia and some countries in the Americas. Do you know what’s the most expensive coffee in the world? When I was in Santa Fe de Antioquia(in Colombia, not New Mexico) i walked past an office (converted old colonial building) with a giant Juan Valdez logo painted above the door. I know the story and commercials talking about that coffee being from Colombia…but it never dawned at me it was actually true until i was in Santa Fe. Im not going to lie – I kinda got wicked excited by seeing something from my childhood memories in person and had to take a photo. 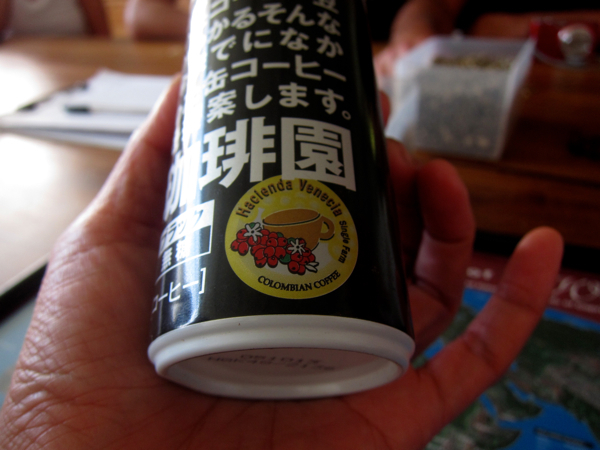 Interesting findings about local coffee! This is my favorite post of yours, because I’m obsessed with Colombian coffee. I LOVE Juan Valdez. I think u will love this place, Andi!